The diet industry don’t want you to know this but diets don’t work. If you want to know who’s going to be overweight the following year, then take a look at who’s on a diet right now. Diet books, slimming shakes, weight-loss clubs, weight-loss bars and all the other paraphernalia to do with the weight-loss industry is a multi-billion pound market. From your high protein and low carb diets to your low fat, no fat or no carb diets, it seems as though there are as many different diets out there as ideas for fancy new names. I’ll admit that in the short term, some of these diets do help you to lose weight. But, by and large the vast majority of people who complete these diets put the weight straight back on again once the diet is over….and then some more on top too. Moreover, a vast amount of money has been made from the array of diet programs out there – and even if what they claim does work, if your mind isn’t right then the program won’t work for you anyway. Remember, if you ‘train the mind…the body will follow™’. So why does dieting often lead to a rebound gain in weight after a short term weight loss? Well, when you undertake a calorie restricted diet, your body doesn’t get the number of calories that it might be used to and so while in the short term, it might help with weight loss, when you start eating again (a sensible amount of calories) the body will start to hoard them. This is because in a calorie deprived mode, the body triggers what is known as the ‘starvation response’ and starts to retain food rather than burn it for fuel. This is because the body is smart – having evolved over thousands of years – and as it doesn’t know where the next meal is coming from, it decides to protect itself by keeping hold of the food. In addition, rapid weight loss is often the result of a loss of water from the body and not the quantity of fat you have. Think about the ‘starvation response’ for a minute. You (or rather human beings in general – perhaps not you or I) can go months without food. The reason for this is that as food becomes more and more scarce to us, the body with all its remarkable abilities starts to slow down the rate at which it burns calories. You see, many years ago, our ancestors had to cope with droughts, floods, not finding food day to day or hour to hour (unlike us today) and so the body had to survive and the starvation response was the solution. Unfortunately for us, the body can’t tell the difference between dieting and starvation and so it unleashes its defence mechanisms. A calorie is the energy that’s needed to raise the temperature of one gram of water by one degree Celsius. A kilo calorie (kcal or C) is 1000 calories and is what is used on food packaging to denote the amount of energy provided. So, when I say that the average man needs about 2500 calories, it really means 2500 kcal (or 2500 x 1000 calories). 1) Low calorie diets will reduce your metabolic rate. Your metabolic rate is the rate at which you can burn off fuel. In essence, the less you eat, the less you burn, the more you eat, the more you burn. It’s like when you adjust your spending to suit your budget. When I finished university, I went off travelling. While travelling, I lived on just over £100 a week and I was able to get by quite happily with that. When I returned home and started working, I was earning £400 a week and my lifestyle changed in accordance with that, as I started to spend according to my means. When I lost that job through redundancy, I was suddenly on an allowance from the government and had to live on £60 a week. Do you think that my lifestyle changed a bit? Was I able to go out and live as I had or did my rate of living have to slow down? And it’s the same with your metabolism. The less food in, the slower your metabolism is in order to adjust. Your metabolism is not fixed and changes with ageing and what you do and what you eat. Things like exercising boosts your metabolism, as does adding chilli to your meal, as does drinking water. The excuse of ‘having a slow metabolism’ won’t work with me – sorry! In fact, when calories are restricted you can slow your metabolism by 20-30% and even more in extreme cases. This is all well documented in other books and so I’m not going to dwell on it, but it’s hopefully got you realising that calorie restricted diets aren’t the answer. 2) In addition, low calorie diets also cause a lot of the weight loss to come from muscle and not fat, and with others it is water weight that you are losing. They also increase the activity of the enzymes responsible for storing fat but reduce those responsible for burning fat. Furthermore, low calorie diets decrease the output from your thyroid hormone which is responsible for regulation of your basal metabolic rate – the rate at which you burn fat for fuel. Have you ever been on a diet only to find out that when you came off it, you put all of the weight back on and then more too? Initially, when you’re on the diet, things look like they’re going well. The diet is working and you’re losing weight and then you hit a plateau (largely as your body adapts to the reduction in calories as described above). You then start to get a little despondent about not getting the results you were getting and then you start to eat something that you shouldn’t and then before you know it, you’re eating what you were before but only this time, because your body has been in starvation mode, it continues to hoard the food. Your metabolism has already reduced, so although you’re eating the same as what you did before, you actually find that you put on more weight. You try another diet, and so the cycle starts again, and again, and again. Before you know it, you’re in this endless loop of diet after diet. That’s no way to live, in my opinion. Better to stick to eating a food regime that is sensible, sustainable and one that you enjoy. The only way for you to really stay healthy is if you adopt a habit of sensible healthy eating which you can maintain for a lifetime. Forget the never ending cycle of quick-fix dieting which is unsustainable in the long term. 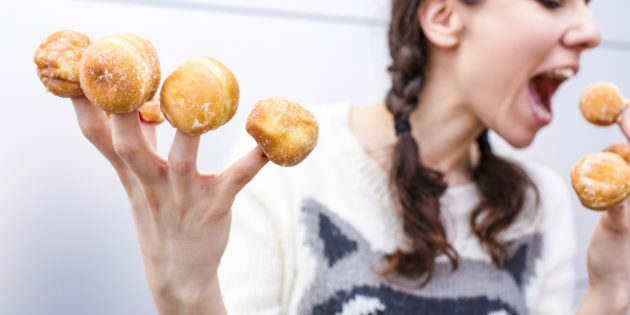 OK, so what are the other reasons why diets don’t work? I mentioned the word ‘temporary’ and the majority of these diets provide exactly that – a temporary fix. The goal of most diets, especially those with unrealistic expectations about which foods you can and can’t eat is this; it’s to get you to your target weight but they don’t think beyond that. The goal for many of these diet books is for you to attain but not maintain your target weight. This is a good point to introduce you to the concept of the unconscious mind (or sub-conscious mind, as it’s sometimes referred to). The unconscious mind is responsible for a whole host of other things like regulating your body temperature, making sure you breathe, organising your memories and making mental associations. Your unconscious mind is actually massively more powerful and active to your well-being than you probably realise. Think of your whole mind (conscious and unconscious) as being like an iceberg. 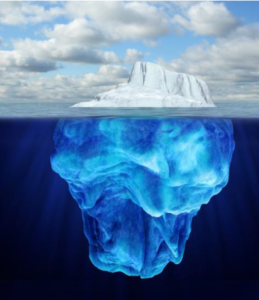 You could consider that the tip of the iceberg; the thing we actually notice, is the conscious mind, but what supports that, below the surface and many times larger, is the massive remainder of the iceberg – the unconscious mind. When you consider just how large and prominent the unconscious mind is, you begin to appreciate that perhaps what goes into that unconscious mind is very important. Studies into the power of the unconscious mind are really only in their infancy and it’s quite exciting where this field of research is going to lead. But getting back to the task in hand; when you consciously set a diet as a goal, it becomes set in the unconscious mind too. It understands it’s on a 6-week diet (or whatever the length of time happens to be), but it also understands that it’s just temporary. I consider diets to be a lot like projects. By that I mean that a project is something with a goal, a timeline for achieving it and a method (or strategy) for getting there. Imagine this scenario for a moment. It’s two months until barbecue season and you want your garden to look great for a party. You get a plan together including: deciding what needs to happen and when, hiring a gardener and then overseeing the project. Two months pass and you have a fabulous garden – ready to entertain all your friends. What happens though once the party is over, now that the goal has been achieved? If you want the garden to remain looking nice, you’re going to have to make sure that you have all the right tools and strategies in place to maintain it. Otherwise without the right tools and appropriate effort, the lawn will overgrow, the weeds will take over and your path will get covered in moss. And diets are similar, in that they have a goal, timeline and strategy for getting there. The trouble is that their goal is usually just to get you to the size/weight/physique you want and not provide you with the skills, tools and mindset that you need to maintain what you’ve achieved. And when you’ve achieved your goal, your unconscious mind realises this also and says: “So – now what?” and it moves its focus from the target to shift its attention elsewhere. If there are no plans in place with how to continue along the healthy route then all your effort is wasted. The start of any goal should really be to hit your target weight, get into that outfit or be that perfect shape. Then the real goal (and it’s an ongoing one) is to maintain and improve upon it. It’s really important to be thinking in those terms and not just looking 2, 4, 6 weeks into the future – only seeing yourself at a particular party or on a particular beach and not seeing yourself beyond that point in time. Your unconscious mind needs the message from you that this is the way it is from now on – not just that this is how it is for the short term only. After all, there are going to be many more barbecues and it’s better to maintain that garden consistently instead of having to start from scratch each and every time. So start right now to get into the mindset of a lifestyle diet, one with healthy unprocessed foods and remove from your consciousness the idea of following the next new fangled diet that some celebrity is endorsing. Trust me, in the long term it’s better to take small steps to get there and stay there, rather than just following a diet plan which offers quick large gains. It’s not healthy to have your body change that dramatically and quickly anyway and it won’t work in the long run. I don’t follow a diet myself. I have never been on a ‘diet’. I have principles that I largely adhere to (allowing room for flexibility though), and this is detailed in this post about the PANLO 80/20 principles to eating for health, vitality and energy. Does this make sense? Let me know your thoughts below.